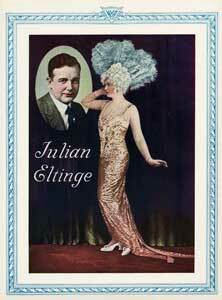 Famed vaudeville cross-dressing act Julian Eltinge performed today at the Orpheum, though the Times reported him to be "a trifle too old and portly to exactly suggest the flapper — his impersonation is limited to the more matronly of the species." Eltinge was approximately 46 (reported birthdates vary), and had been doing female impersonations in his act for over 35 years. At the turn of the century. Eltinge became well known for his parodies of iconic female figures like the Gibson Girl (his was the "Simpson Girl"), and was lauded as "the most fascinating woman on the American stage." In 1910, he opened The Fascinating Widow, a musical comedy where he played both male and female roles, the latter of which would become his signature role. Eltinge was a hit, marketing his own line of magazines featuring beauty tips, as well as a line of cosmetics. Ads for his cold cream read, "See what the Julian Eltinge cold cream does for a man. Imagine what it will do for a woman." Eltinge enjoyed a fairly successful career in silent film, though his weight, age, and reported alcohol abuse made it difficult for him to continue to play an ingenue. Additionally, Hollywood laws that made it illegal for a man to perform in women’s clothing reduced his act to singing in a tuxedo while pointing at a rack of dresses. Throughout his life, he vehemently denied rumors that he was a homosexual, saying, "I am not gay. I just like pearls." More information on his fascinating life can be found at The Julian Eltinge Project. < Razors Pain You, Rivers Are Damp	> Will The Bark Out?